THIS GIVEAWAY IS OPEN INTERNATIONALLY. So i hope everyone can join but remember you must be one of my follower to join. Hello my lovely readers . Now, I'm back with giveaway again. I honestly cannot put into words how thankful I am that I have reached 2000 followers already. When I started blogging in 2009, and when I subsequently concenctrated on beauty blogging in 2010, I never really thought I'd ever come to this day. 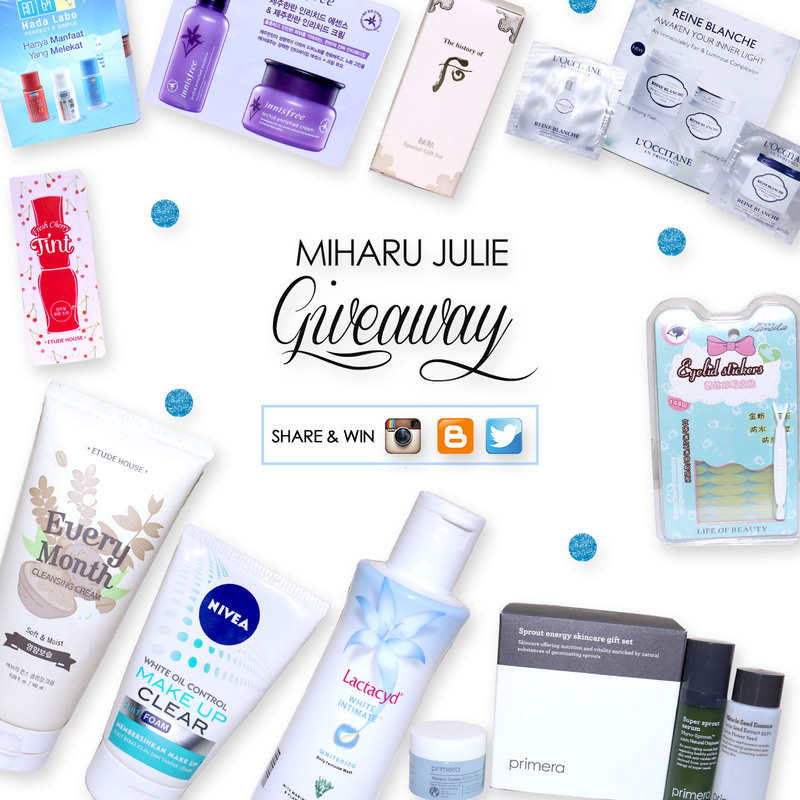 When I started Miharu Julie Blog, I was already so happy when I got my first 10,000 views and 100 followers . I met every little milestone with extreme excitement and enthusiasm. And I can't really believe that after celebrating many little milestones that I've already made a much bigger one. This time I make a giveaway to honor and celebrating my loyal readers (to spread a little love your way). I will be giving beauty makeup and skincare to one lucky reader. Hope you love this giveaway as much as I do. Blogging is not easy, I will admit. It's something that takes so much effort, so much time, so much love. It's a continuous self-improvement process. When I started blogging, my photos and formats were so horrible, and while they're still not the bestest best today, at least they're no longer like before. It's also a constant test of motivation. No one will really follow up on you to make that post or take that photo, it's up to you to do it. Blogging has already been a significant part of my life, which is why I celebrate milestones like this. Anyways, let's get started with the giveaways! I'll follow back all participant blog on Google Plus. The winners will be announced via email and on @MiharuJulie Twitter. If winner doesn't respond within 2 day, a new winner will be selected at random. Great giveaway, I'm taking part of it! Amazing giveaway! Thanks for sharing!! Quanta coisa legal! Boa sorte a todas! Hi girl!! Great post!! I following you now with GFC..follow me back, please? Awesome products and giveaway! Sweet!!! I've followed you and cant wait to see more of your post.